Loved this product. Worked really well on my pre-lightened hair! I left it on for the maximum time and whilst developing I used my hair dryer for half of the time on a high slow heat and also massaged small sections at a time with two fingers and a thumb from top to bottom to make sure the colour ran through evenly. Would use again. Response from Schwarzkopf LIVE: Thanks for taking the time to review Rosie! Response from Schwarzkopf LIVE: Great to hear that Vicki, thank you for taking the time out to review! I have pre-lightened hair at the ends and naturally greying at the roots. The colour turned my base colour a pinky-ginger, which wasn't ideal, although the ends came out quite a strong purple/pink. I had to overdye the roots to mid ends with a semi-permanent purple to tone down the ginger. it is still gingery and will now need to dye again to get rid of the orange tones. the colour looks ok and the lightening effect is very even on the fresh hair, which is great, but it is nothing like what is on the box, or what I was hoping to achieve. I love the colour but after nearly a week the colour is nearly faded to nothing. Disappointed that after a week I will have to colour my hair again. Not good for a permanent hair dye! I don’t know why this only has three stars! I thought I'd give this colour a go for a change, I don't know what I did wrong but my hair was just a very light blonde, disappointing to say no sign of the lilac shade. The only thing I noticed was the after treatment sachet should have been used on towel dried hair, I used this straight after rinsing the colour. Response from Schwarzkopf LIVE: Hello Nicole, if you would like to speak with our Colour Experts regarding your colour result, they an be reached on 0800 328 9214 or at consumer.advisory@henkel.com :) Thank you! After reading some reviews about this product, I was a bit unsure whether it would work on my hair (pre lightened & ash blonde dyed) but I loved it so gave it a go. Worked amazingly!! The top looks pretty much like the pic on the box and the ends just a tad darker but no ginger! Yes it is pink but if you look at the box you will see that! Will be buying again when this fades! Response from Schwarzkopf LIVE: Hello Rachel, thank you for taking the time to review. Colour fading is normally attributed to an increase in your hairs porosity. When you hair is porous, the cuticles lay open and rough, allowing for the colour molecules to quickly rinse away. To help shut down the cuticles, locking in the colour, make sure you use moisture rich treatments at least once a week and a shampoo/conditioner specially formulated for coloured hair. Hope this helps! I was disappointed with the colour as it has turned out quite a bright pink. I was wanting a subtle lilac shade. Wondering if I would have been better using more silver based shade . I’m hoping it will fade quickly or wondering what I can to do tone it down a lot.my hair I’d naturally pale blonde with a lot of grey in it. Was hoping for a pale purplish blue colour but it is more pink! During the developing time it went a very bright pinky colour so was quite worried, once washed off it is actually a pale pinky colour that isn't too bad but not really what I wanted. Don't think it will last long either. Response from Schwarzkopf LIVE: Hello Sarah, we are sorry to hear of your disappointing colour coverage. Unfortunately, this shade is not recommended for use on pre-lightened hair :( However, if you would like any help or advice regarding this, please contact our Colour Advisory Team on 0800 328 9214 or at consumer.advisory@henkel.com. Thank you. Used this on my natural dirty blonde hair, and it left me with a pinkish ginger with blonde undertones colour. Definitely NOT “cool lilac”. The dye went on ginger and didn’t change. Definitely wouldn’t recommend. Response from Schwarzkopf LIVE: Sorry to hear of this Erin! If you would like any help or advice regarding this issue, please contact our Colour Advisory Team on 0800 328 9214 or at consumer.advisory@henkel.com. Thank you for taking the time to review! I used this product on my natural medium blonde hair and still got the pink tones that others are referring to as well. I do like the result so I'm not massively dissapointed but deffinately not lilac. Response from Schwarzkopf LIVE: Hello Lindsay, thank you for taking the time to review! The more natural warmth/red tones you have in your hair, the more intense result you will achieve with the Lightener+Twist tones, as the pink/purple will sit on top of the natural tones, accentuating a warmer look. Hope this helps! Used this colour to dye my hair, I have bleach blonde hair and the colour came out pink not lilac. Response from Schwarzkopf LIVE: Hi Alice, thank you for your review! The Lightener+Twist shades are recommended for use on Naturally Light Blonde through to Dark Blonde hair colours. We can assume you've achieved an intense result due to the previous bleach on your hair. You can create a pastel shade on bleached hair using our Ultra Brights or Pastel range :) Hope this helps! Very disappointed, my hair went ginger !! Response from Schwarzkopf LIVE: Sorry to hear of this Joanna! If you would like any help or advice regarding this, please contact our Colour Advisory Team on 0800 328 9214 or at consumer.advisory@henkel.com. Thank you! Response from Schwarzkopf LIVE: Hello Claire, sorry to hear of this! The Cool Lilac is recommended for use on naturally Light Blonde through to Dark Blonde hair colours, if used outside of this range, and/or on hair that has been previously coloured, the results will vary. If you would like any further help with this, please contact our Colour Advisory Team on 0800 328 9214 or at consumer.advisory@henkel.com. Thank you. amazing!no yellow tones ,so shinny! Having suffered a bout of alopecia and ending up shaving all my long brown hair off, I've ended up with a cool cut but have to bleach my hair every 6 weeks because what has grown back is pure white leaving a patchy mess like a badger, so... I've tried every bleach and colour combo under the sun from pink to lilac and any pastel shade I can get my hands on. I picked up this cool lilac from boots and was interested to know if the lightening/colouring in one would work and therefore half the amount of abuse my new hair suffers. I am really pleased with the results and do hope it lasts as instead if spending all evening with different potions, powders and creams, I was all done in 40 minutes. Fabulous conditioner too. This means I'm less worried that I'm not damaging my already fragile hair any more than necessary. Sorry to say that my hair has not changed colour at all! I used the whole bottle on half my hair and nothing! I left it on for 45 minutes too. My hair isn't dyed and it's a dark blonde. Response from Schwarzkopf LIVE: Hello Joanne, sorry to hear of this. The Cool Lilac is recommended for use on naturally Light Blonde through to Dark Blonde hair colours, if used outside of this range and/or on hair that has been previously coloured, the results will vary. Hope this helps! Response from Schwarzkopf LIVE: Hey Cara, we're sorry to hear of this! Normally, quick colour fade is attributed to an increase in your hairs porosity- so make sure you're using moisture rich hair treatments to help combat this :) Thank you for taking the time to review! Pre lightened my hair so it would lift better, put dye on left for max time and hay presto my hair is now a dark shade of ginger... hate it! So much for it lightening it 4 levels! Response from Schwarzkopf LIVE: Hello Katie, we are sorry to hear of this. Unfortunately, we wouldn't recommend this shade is used on pre-lightened hair. If you would like any help or advice regarding this, please contact our Colour Advisory Team on 0800 328 9214 or at consumer.advisory@henkel.com. Thank you. Read the advice, I have naturally light blonde hair which has been lightened recently, the cool lilac 104 has dyed my hairs roots yellow/orange and barely dyed the tips the cool lilac colour, not happy with results at all!!!! Response from Schwarzkopf LIVE: Hello Maria, we're sorry to hear of your disappointment. Unfortunately, we do not recommend this shade on pre-lightened hair. For best help and advice with this, please contact our Colour Advisory Team on 0800 328 9214 or at consumer.advisory@henkel.com. This hair dye has got to be used on pre bleached hair as the lightener is not strong enough to lift even dark blond. I applied this to very blond pre-lightened hair. I'm sorry to say I was not happy with results, it didn't take to all my hair and its more a pink than violet. I will give one star for my hair being soft and for nice smell. Response from Schwarzkopf LIVE: Hello Michelle, we do not recommend this shade is used on Bleached/ Lightened hair as it is too a lightener, lightening up to 4 levels. If applied to already lightened hair, it can affect the condition of the hair, and cause an uneven result due to an increase in the hairs porosity. If you would like any further help or advice with this, please contact our Colour Advisory Team on 0800 328 9214 or at consumer.advisory@henkel.com. Thank you. Love the colour, but finding that the lilac is fading very quickly despite me using colour protect shampoo. Response from Schwarzkopf LIVE: Hi Catherine, thanks for the review. Colour longevity can vary according to individual hair type/history, to help colours last we'd recommend not washing hair too frequently and using products specifically designed for coloured hair. Thanks! Put this dye on my prelighted hair...it's made my roots a very vibrant pastel purple, hasn't took all over my hair ;even though I used 3 boxes and my hair is shoulder length) looks a right mess. Hasn't gone to any of the colours shown on the back of the box or the front. Response from Schwarzkopf LIVE: Hello Rachael, we're sorry to hear of this. Unfortunately, the Lightener+Twist shades are to be used on Natural Blonde hair colours- we do not recommend using these on Bleached/PreLightened hair. Thank you for taking the time to review! Didn't really go "lilac" on my pre-lightened hair, it went more "pink". Faded to a really nice pastel pink after a few washes and then disappeared completely, leaving a nice cool white behind. Not bad, but NOT lilac! Response from Schwarzkopf LIVE: Hi Traci, our Cool Lilac shade is designed to be used on naturally light blonde through to dark blonde hair and will give unexpected colour results if applied to pre-lightened hair. If you'd like some more advice on this, do contact our Schwarzkopf Advisory Service on Freephone 0800 328 9214 and an advisor will be able to assist further. Thanks. I wasn't entirely happy as it only dyed some of hair other than that I loved the colour. Response from Schwarzkopf LIVE: Hi Hayley, sorry to hear that. As with most colourants, results can be affected by individual factors such as hair type/history. If you'd like some more advice on this do contact our Schwarzkopf Advisory Service on Freephone 0800 328 9214 and an advisor will be able to assist further. Thanks. Response from Schwarzkopf LIVE: Hello Katherine, we're sorry to hear of this. I can only recommend you contact our Colour Advisory Team for help and advice regarding this issue. They can be reached on 0800 328 9214 or at consumer.advisory@henkel.com. Thank you. Response from Schwarzkopf LIVE: Hi Jill, sorry to hear that. To improve colour longevity, we'd recommend using shampoos and conditioners specially designed for coloured hair, as well as not over-washing your hair. If you need some more advice on this, do contact our Schwarzkopf Advisory Service on Freephone 0800 328 9214. Thanks. Response from Schwarzkopf LIVE: Hello Vicky, we’re really sorry to hear that. Our LIVE Lightener + Twist shade is designed to be used on naturally light through to naturally dark blonde hair, so will give an unexpected colour result if applied to colour outside of this range or pre-lightened hair. If you would like to speak to our Colour Advisory Team for any advice or help with this, they can be reached on 0800 328 9214 or at consumer.advisory@henkel.com. Thank you. I don't have a "before" photo, but my hair was blonde dip dye (bottom bleached quite recently, with little/no yellow - it was pretty white when i started) and this is my "after" result. My roots were my natural colour before dying, and I applied to dye all over. I left the dye on for aprox 40 minutes (I was too impatient to wait the last 5 minutes!). The bottom (previously bleached) sections went a very nice cool purple, whilst my roots have stayed almost the same colour. If anything, i would say that my roots have gone slightly orange. I don't mind though. Response from Schwarzkopf LIVE: Thanks for the review, Georgina! Response from Schwarzkopf LIVE: Hi Sophie, thanks for the review. You're right in thinking that your pre-lightened hair would have affected the final colour as this shade is designed to be used on natural blonde hair. You can always perform a strand test to ensure you're happy with the colour results before colouring. Thanks. Response from Schwarzkopf LIVE: Thanks for the review, Nicola! Response from Schwarzkopf LIVE: Thanks so much for the review, Roxanne! Totally devistated. This product has turned my hair BRIGHT PINK. And not even a nice pink. Nothing like the box... what a total disaster. Avoid this dye, unless you like a gamble. Response from Schwarzkopf LIVE: Hello Michelle, we're sorry to hear of this. When you can, please contact our Colour Advisory Team for help and advice regarding this. They can be reached on 0800 328 9214 or at consumer.advisory@henkel.com. I used this product on my naturally blonde hair which is very light first time I've died my hair, it's killed my hair it feels like ive bleached it 5 times in a row also my hairs falling out and it only died a tiny part of my hair at the top I left it for 35 minutes so thanks !! Response from Schwarzkopf LIVE: Hello Clio, we're very concerned to hear of this. Please contact our Colour Advisory Team on 0800 328 9214 or at consumer.advisory@henkel.com, and they will help you with this. Thank you. Response from Schwarzkopf LIVE: Thanks very much for your review, Emma! Response from Schwarzkopf LIVE: Hello Lisa, we're sorry to hear of your unexpected results. Our LIVE Lightener + Twist shade is designed to be used on naturally light through to naturally dark blonde hair, so will give an unexpected colour result if applied to colour outside of this range or on previously coloured or pre-lightened hair. If you would like to speak to someone further about this, please contact our Colour Advisory Team on 0800 328 9214 or at consumer.advisory@henkel.com. Thank you. Fab colour. I wish you did it without the bleach in as well, so I could refresh the colour without the damage. Response from Schwarzkopf LIVE: Thanks for the review Clair. If you want to refresh the colour, you could try using our LIVE Purple Punk shade mixed with some of the in-pack conditioner to create a similar pastel shade - as it's semi-permanent it can be applied whenever a colour top-up is needed. Thanks! My hair went a nice pinky colour in some places but the areas that are my natural colour (darker blonde) went a gingery colour. It's definitely not lilac. I think you'd only achieve the colour on box if your hair was white blonde beforehand. Response from Schwarzkopf LIVE: Hi Lauren, thanks for your review. As with most colourants, results can vary according to individual hair type/history, we'd like to find out some more about your experience, so do contact our Schwarzkopf Advisory Service on Freephone 0800 328 9214 when convenient. Thanks. Fairly straight-forward process. Application would be easier if the dye had some colour in it so you can see any patches missed. It was also fairly thick so squeezing it out of the bottle wasn't easy and working it into and through dry hair was fairly labour intensive. I have shoulder length hair so it took about an hour. I could see the colour developing and was worried that it was going to come out bright pink but I was pleased with the results when I rinsed everything out. But it's definitely more pink than lilac. But it came out a nice muted pink with silvery ends so it really shimmered. Pretty colour. But I noticed that hair styling products and spray did lighten it over the course of a week. And then first time I washed it a lot of the pink came out. Now I'm left with an ashy blonde. So if you're looking for no commitment this is a good bet. I would use it again, but I know now that no way is this a semi permanent product because the colour changed after one wash. Response from Schwarzkopf LIVE: Hi Lesley, thanks for the review. Colour longevity can vary from person-to-person according to their individual hair type/history. We'd recommend using shampoos/conditioners specially designed for use on coloured hair, and not over-washing your hair. Hope this helps. Wanted to go the colour on the box but I have gone very pink .looks nice but to bold for me really good product would use again but not this shade . Response from Schwarzkopf LIVE: Thanks for your review, Cheryl! I was sceptical about using this hair dye as it was for blonde hair and I already had a silver look! I took the risk and it came out a really nice shade, a little more pink than expected but I loved it! The only thing, which is my own fault, is that I got it on my roots, which is quite a brown colour, it then lifted a few patches, but even so, love it! Response from Schwarzkopf LIVE: Hi Sam, this shade is designed to be used on naturally light blonde through to dark blonde hair, so may give unexpected colour results if applied to hair outside of this range. If you'd like some more advice on this, do contact our Schwarzkopf Advisory Service on Freephone 0800 328 9214. Thanks. Loved this product, worked fab on my pre-lightened hair. As it was developing I massaged small sections of hair with two fingers and a thumb, through to the ends, to make sure all was covered, I also used my hairdryer for half the developing time, and left for the maximum time stated. Really pleased! Response from Schwarzkopf LIVE: Thanks very much for the review, Rosie! Went pink nice colour but not what I was after, also nearly completely washed out after only one wash. I used the cool rose in the summer and this one was great and really lasted so I expected the same result with the one, really disappointed. Disappointed with the result, my hair was previously platinum blond, I now have very bright lilac hair not as indicated on the box for light blond hair!! I am now stuck with a colour I hate and have no idea how to get rid of it. Was not happy that it does not state on the box that this product does not work well on bleached hair, it just says suited for these types of colours on the back. So my hair was lighter than all and didn't even take. Just made the bleach look more natural.Wasted my money. Wasn't happy at all, so brought a colour from a professional salon to get the results I wanted. Response from Schwarzkopf LIVE: Hello Jade, we do not recommend this shade on Bleached/PreLightened hair, as stated in the instruction leaflet- the shades depicted on the back of the pack are the recommended shades to use this colour. We're sorry you've had a disappointing result however. Thank you for taking the time to review! Response from Schwarzkopf LIVE: Hello Sarah, we’re really sorry to hear that. Our LIVE Lightener + Twist shade is designed to be used on naturally light through to naturally dark blonde hair, so will give an unexpected colour result if applied to colour outside of this range or on previously coloured and pre-lightened hair. Please contact our Colour Advisor Team for more help with this- they can be reached on 0800 328 9214 or at consumer.advisory@henkel.com. Thank you. Response from Schwarzkopf LIVE: Hi Shirley, thanks for getting in touch. As it is difficult to know the history of any hair extensions (whether they have been coloured previously, chemically cleaned, natural or synthetic etc.) it is difficult to predict the outcome of any colour on hair extensions. You can always perform a strand test to see how the colour takes. Do contact our Schwarzkopf Advisory Service on Freephone 0800 328 9214 if you'd like some more advice on this. Thanks. I used this hair dye today and it's come out exactly how I wanted! I have light brown hair naturally but have always had it highlighted so I put it over the bleach. It's covered my roots so well and has lightened it and given it a lovely slight lilac tint which is what I wanted! Would recommend! Response from Schwarzkopf LIVE: Thanks for taking the time to review Laura! Response from Schwarzkopf LIVE: Hi Sharon, we're sorry to hear that you didn't get the results you were expecting. We'd love to help you further with this so if you'd like to, please call our Schwarzkopf Advisory team on 0800 328 9214 and an advisor will be happy to help. This has made my hair go a dark pink purple colour. Not happy at all. My hair is blonde thinking that this will give it a lovely pastel colour how wrong was I will have to dye my hair another colour to rectify it. Response from Schwarzkopf LIVE: Hello Al, we're sorry to hear of this. Our LIVE Lightener + Twist shade is designed to be used on naturally light through to naturally dark blonde hair, so will give an unexpected colour result if applied to colour outside of this range or pre-lightened hair. When you can, please contact our Colour Advisory Team for help with this issue. They can be reached on 0800 328 9214 or at consumer.advisory@henkel.com. Thank you. Really dissapointed came out bright purple not the subtle tone I wanted. Not an even colour really upset with the results. Response from Schwarzkopf LIVE: Hi Sam, we're sorry to hear that you didn't get the results you were expecting. The Lightener + Twist range is designed for use on naturally blonde hair so results can vary if used outside this application range. We'd really like to help you further so if you'd like to, please contact our Advisory team on 0800 328 9214 and an advisor will follow up with you. I love this colour and have used it several times. The blonde base is lovely but the lilac twist only lasts about a week which is a real shame. It's misleading as it's not permanent lilac, it's permanent blonde. Response from Schwarzkopf LIVE: Hello Kirsty, we're sorry to hear of your quick colour fade. This is normally attributed to an increase in your hairs porosity. When your hair is porous, the cuticles lay open and rough- allowing for a quick leak of the colour molecules when washed. To shut down the cuticles, locking in the colour, make sure you're using moisture rich treatments once a week and a shampoo/conditioner specially formulated for coloured hair. I hope this helps! Was really looking forward to putting this on. So glad i did a strand test first though, its not something i usually do! Now its not as if the majority of my hair is dark, towards the roots maybe. Instructions say 30-40 mins or if your doing a root touch up, put on roots for 30-40 mins and then rub into the rest of your hair and leave for another 5. I put it on the whole strand and rubbed it in well as advised. After 20 mins my hair looked decidedly pink, so i started to worry and washed it off. Cool lilac - yeah what ever! My hair is now pink! How did i get bright pink from cool lilac. I might as well have bought one of the vibrant colours and put that straight on my hair. So miffed! If i could have done half a star i would of! Response from Schwarzkopf LIVE: Hello Sam, we’re really sorry to hear of this. Our LIVE Lightener + Twist shade is designed to be used on naturally light through to naturally dark blonde hair, so will give an unexpected colour result if applied to colour outside of this range or pre-lightened hair. If you would like any further help or advice with this, please contact our Colour Advisory Team on 0800 328 9214 or at consumer.advisory@henkel,com. Thank you. Made hair pink and it was blonde do not use !! Response from Schwarzkopf LIVE: Hello Rachel, we’re really sorry to hear that. Our LIVE Lightener + Twist shade is designed to be used on naturally light through to naturally dark blonde hair, so will give an unexpected colour result if applied to colour outside of this range or pre-lightened hair. Please contact our Colour Advisory Team on 0800 328 9214 or at consumer.advisory@henkel.com, who can help you further with this. Thank you. This colour came out pink in my hair not lilac. Although the colour is still nice it's not the colour I was going for. Was a bit gutted when I seen the colour as I was expecting it to be a tint of lilac, but the pink colour is still nice. Response from Schwarzkopf LIVE: We're sorry to hear that you didn't get the colour result you were expecting Georgia. We'd love to help you further with this so if you'd like to, please call our Advisory Team on 0800 328 9214 and an advisor will be happy to discuss this in more detail. I really loved this colour!!! Really makes my blue eyes pop and is a rose gold tone at the top and tones into a nice lilac purple towards the lengths of my hair, very very please with the results and will continue my use with this product :) thankyou very much, made my hair dreams come true! Response from Schwarzkopf LIVE: So great to hear it Sydney, thanks very much for the review! Response from Schwarzkopf LIVE: Hello Lisa, we're really sorry & concerned to hear of this. Please contact our Colour Advisory Team for help with this issue- they can be reached on 0800 328 9214 or at consumer.advisory@henkel.com. Thank you. Response from Schwarzkopf LIVE: Hello Sarah, we're sorry to hear of your disappointment! The Lightener+Twist shades are unfortunately not recommended for use on Bleached/Pre-Lightened hair. This is because they are too a lightener, which can then affect your hair condition and coverage if applied to already lightened hair. 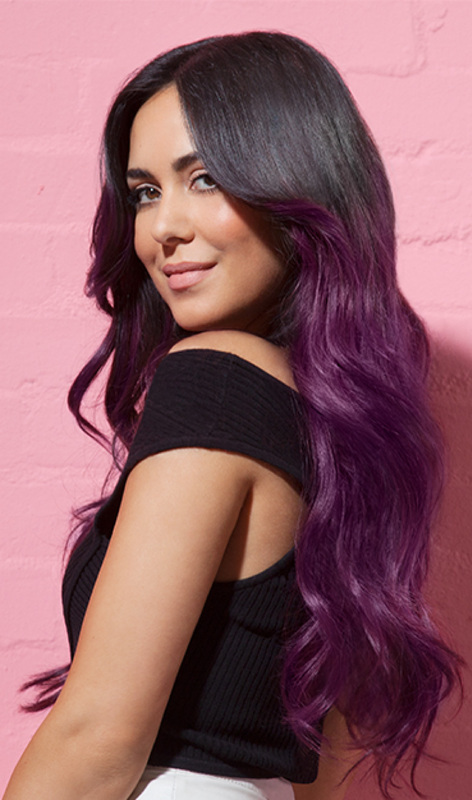 For a similar pastel lilac tone, we suggest the use of the Ultra Brights or Pastel range, in the shade Purple Punk. Hope this helps! Response from Schwarzkopf LIVE: Hello Danni, we're sorry to hear of this. Unfortunately, the Lightener+Twist shades are not recommended for use on Bleached hair. This is because they are too a lightener, and can affect your hairs porosity if used on top of bleached hair- which in turn, will cause an uneven, unwanted result. For pastel tones on Bleached hair, we recommend you use the Ultra Brights or Pastel range, which are designed to be used on Bleached hair. Hope this helps. My hair turn pink instead of Lila although I bleached before to remove all colour. This is how I look with mutitones in my hair. Response from Schwarzkopf LIVE: Hey Jackie, thanks for the review! The LIVE Lightener + Twist range is designed for best results on naturally blonde hair so application on bleached hair can cause unexpected results. If you'd like to discuss this further please contact our Advisory team on 0800 328 9214. Thank you! Colour has come out very patchy and more pink towards the front & fringe, even though the back underneath was done first. No real colour change there, and very disappointed with the outcome. Will have to buy another colour to put over the top of this. Such a shame, as I had very high hopes for this one. Response from Schwarzkopf LIVE: Hi Laura, we're sorry to hear that you didn't get the coverage/result you were expecting. There are a number of factors that can affect a colour result and we'd really like to help you further so if you'd like, please call our Advisory team on 0800 328 9214 and an advisor will be happy to discuss. Thanks. So unimpressed!! Used this dye last week and whilst it wasn't the colour I thought it would be, I LOVED it, it was such a nice platinum blonde with a pink/purple tint, however after 1 wash it has completely faded?! You can barely even tell I've died it. I have really light blonde hair anyway so didnt think there would be any problem with the colour taking, but my hair is extremely thick so I used two packs of hair dye and left it on for quite a while. Would have been a 5 star review if the colour had stayed!!! What a waste of money! Response from Schwarzkopf LIVE: Hi Maddie, we're really sorry to hear you had a problem with colour fading. This can be caused by a number of factors and can vary from individual to individual. For the best personalised advice on this, we'd recommend contacting our Advisory team on Freephone 0800 328 9214 and our colour experts will be happy to help you further. Thank you. It doesn't go anything like what it says but I still love the colour. It's pink not Lilic. Response from Schwarzkopf LIVE: Hi Jenna, thanks so much for the review! We're glad to hear you're loving the colour but sorry it's not quite what you expected. If you'd like to discuss this further, do give our Advisory team a call on 0800 328 9214. Thanks! My lightened hair had become really 'brassy yellow' the lilac really toned my hair down. The result...a very cool highlighted lilac ash blonde, and no roots! Not a drastic change, but enough to make people notice. Very happy with pastel results. Response from Schwarzkopf LIVE: Lovely to hear the feedback, Polly! I used this on my hair last night it has taken lovely to thr ends, but my roots are like a golden colour, should I put the rose colour, on top of this to make it look better . Response from Schwarzkopf LIVE: Hey Michelle, thanks for the review! We wouldn’t recommend reapplying another permanent shade immediately over the top, but if you give our Advisory team a call on 0800 328 9214 they’ll be able to help you further to even out your colour. Response from Schwarzkopf LIVE: Hi Brydie, sorry to hear you didn't get the colour you expected. This range is designed for best results on natural blonde hair so if your hair was pre-lightened, this may explain the unexpected result. Either way, we'd love to discuss this further with you and help you get the right results, so if you'd like to, do give our Advisory team a ring on 0800 328 9214 and an advisor will be happy to help. I hate this! I'm totally gutted, especially as someone who has never been any hair colour other than blonde.. I thought with this being pale it would be safe.. No! My hair is a joke, its bright pink with tinges of purple and ginger orange! Not lilac in the slightest. I'm very not happy! Response from Schwarzkopf LIVE: Hello Robyn, we're sorry and concerned to hear of this. Please contact our Colour Advisory Team for help and advice with this issue- they can be reached on 0800 328 9214 or at consumer.advisory@henkel.com. Thank you! My hair was Platinum blonde, with shades of silver and lavender, this color turned my hair much darker and almost pinkish.. Never trying again.. Response from Schwarzkopf LIVE: Hi Susanna, thanks for your feedback. The Lightener + Twist shades are designed to deliver the best results on various shades of natural blonde hair. If applied to platinum blonde, the results can be more or less intense than expected. We'd love to help you further so if you'd like to, please give our advisory team a call on 0800 328 9214. Thank you. Impressed by this dye although it's more pink than lilac. Hoping it will die down within a few washes! Response from Schwarzkopf LIVE: Hey Kirsten - thanks a bunch for the feedback! Response from Schwarzkopf LIVE: Hi Remi-Mae, thanks for your feedback and we're sorry that you didn't get the results you were expecting. The Lightener + Twist shades are designed to be used on various shades of natural blonde hair so if your hair was pre-lightened (bleached) this can affect the results. If you'd like to discuss this further, please call our advisory team on 0800 328 9214 and an advisor will be happy to help.